Buying a used recreational vehicle for sale? Here’s a simple checklist to help you! Have you decided that a used recreational vehicle for sale is the ideal first motor home for you to buy? Have you realized the financial benefits for buying a used recreational vehicle for sale? Are you ready to get out and find the best quality used recreational vehicle for sale that meets all of your RV dreams and lifestyle on the road needs? If you answered yes to any of the above questions, then you are on the right track to hopping behind the wheel of your first motor home purchase! Buying anything that has been pre-owned or used can be seen in some people’s eyes as risky. In fact, some people say it is a gamble or a game with finding a used motor home for sale that is in excellent condition and fit for the road. Well, if you take under consideration what a big step financially you are going to take when buying something as large as a recreational vehicle used, then it is totally up to you, your patience, and your diligence to find a pre-owned motor home good enough to call home. As a prospective recreational vehicle owner, you should want to take the time to know your subject. Once you find a used recreational vehicle for sale that interests you, use the following check list as a guide to feel in control of your own buying process. If before you even start the shopping and purchasing process for a used recreational vehicle for sale you feel intimidated, use the professional, highly knowledgeable services of an RV wholesaler, such as Pedata RV Center. Pedata RV Center is available to help you through every step to put your ideal, used recreational vehicle for sale into your possession. Make sure all of the owner’s manuals are available. As a first time recreational vehicle owner, you will want to spend some high-quality time with these manuals to help you know your used motor home for sale inside and out! DRIVE IT- listen, look, try the mirrors, the buttons, the brakes, the accelerator, cruise control, get out of the RV and listen. Exterior conditions: Engine- does it start up immediately? Are any belts cracked or wearing thin? Any rust spots? ; Door- does it open smoothly on its hinges? Does the keyless entry work (if applicable)? Are the appropriate railings still attached? ; Side view mirrors- are they there? Do they work? ; Tires- check for wear and tear; used recreational vehicle for sale? ; Ladder- is there one? Does it work? Double check its condition. Interior conditions on your prospective used recreational vehicle for sale: Front wind shield- are there cracks? ; Captain chairs and other furniture- have they been well kept? Are there any tears or rips in the leather? Are there any stains? ; Table and counter tops- are there any scratches? ; Lighting- does it all work? Do the switches match the lighting panel? ; Appliances- does the refrigerator work? Does the freezer stay cold? Does the ice maker make ice? Is it all clean? ; Bathroom/Bedroom- is there enough space? Do the doors work? Do the electronics, such as fans, entertainment systems, retractable blinds, etc. work properly? ; Water- double check all of the faucets, including both the hot and cold water. Major items: Check these major items- generator; roof; tiling or carpeting on floor; furnace; water pump and storage system; and the used RV’s siding. 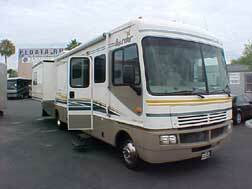 >> Shop Used Recreational Vehicles for Sale Online!